If the last two pieces exchange, is it a draw or whoever has the next turn loses? In a game of today I moved a scout from E1 to E8 to scout a piece at D8, that could only move to D7. So he moved to D7, I to E7, he to D8, I do E8, he to D7 and then I could not move again. Is that correct? I was kind of surprised by this. Feedback pretty please with sugar on top? I just looked in a rules book and it reads: " if all your movable pieces have been captured AND you cannot move or attack on YOUR turn, you must surrender and declare your opponent the winner." According to this, if I can force my opponent to put his last piece beside my last piece and I can move and attack on my last turn, trading our final pieces. My opponent is the only player left not being able to move or attack on his turn, not me. The other player has to show he can do a move. If not, its a draw. There is a difference there probably between making computer software and properly checking the win conditions and human logic and interpretation of the board. The other player should not have to show he can do a hypothetical move after the game is over. The rules state that ON YOUR TURN you have to be able to make a move. If the last pieces are exchanged then the game is over and there is no need to make another move. Unfortunately I cannot find the isf gamerules anymore to verify it officially. Anyway in my offline experience it counts as a draw when both sides are unable to move. Its written in Dutch Sbn website also. And at gravon its implemented that way. They are always trying to follow all ISF rules. That is why I mentioned not knowing what the ISF has discussed on the matter. According to game book rules, it is clearly not a draw. I know all sources that I have seen will consider it a draw but by literal translation of the rules, you cannot make this draw claim. When the rules state "on your turn" that literal means 'on your turn'. If it was intended to say " if at any given time you are out of pieces" then it would be stated that way. The rules very specifically state that " if you cannot make a move on YOUR TURN..."what if the game is over before you are mandated to make another move? Then according to the rules, you have not taken a turn without being able to move a piece where as your opponent has. It is game over for your opponent. If indeed you were required to make another move after the final exchange then its a loss, if you are the one to make the attack to exchange the final pieces, you have made your required move, it's your opponents turn... he cannot move, you win because he cannot move. 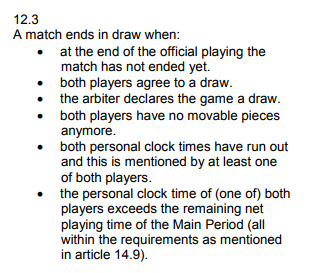 For those of you that want to overlook this written rule for the sake of a 'fair' draw, consider something. Two players that this rule will effect are the ones where better skill should overcome. A player that understands Stratego well will not place himself in a position where he puts his opponent at an advantage over the exachange. He will dance the lake before he lets this happen of course. I believe that any time that a player would have the disadvantage of the final exchange is when the mometum was methodically used by his opponent to take the final exchange. I bet 10/10 that if you saw the last five moves that ended in a final exchange draw, you would see that a player clearly had the momentum and was in control yet not rewarded for his endeavor. Making the final exchange a no-draw would be another element to strategise the beauty of this game. Abiding to this already written rule benefits skill, it's not random. A true draw will still be a draw. But I agree with Wogomite that it could make the outcomes a bit more dependent on skill if it the rules gave the win to the player who made the last move. Thanks to Jens the isf rules are back online. Edited by Don_Homer, 18 October 2017 - 01:35 PM. 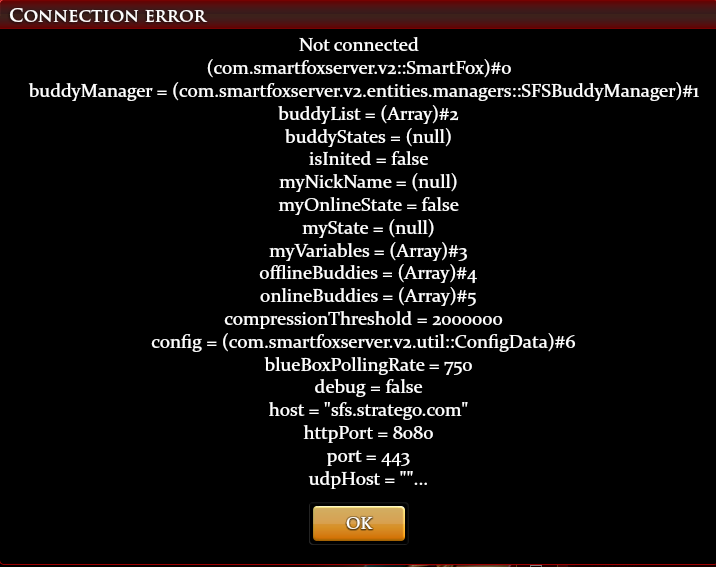 I start the client and I get this, WTF? Today I played vs a Silver General who played really solid and I lost, except that he resigned at the moment he captured a bomb next to my supermegaobvious flag. This was intentional. Why would anyone keep his rating low in this way? I am glad others are starting to catch wind that it's happening. I have around 2500. Gpet0 ( a top greek player) has over 10000 on Gravon , over 10000 here, for a total of 20000+ games. Gpet0 is a legendary marathonplayer. But I think Rave has the record. Rave55 from India has 25.000+ games on gravon alone! And he did this in only 10 years . Edited by Don_Homer, 28 October 2017 - 11:44 AM. From the age of 6 till now, I have played approximately 10.000+ games.